I second the recommendation for Gandegghutte - although the food has got slightly 50/50 reviews in recent years the views are pretty special. If you aren't set on being up top and are happy to walk to other mountain restaurants then it would be a no-brainer to look into places like Zum See, Findlerhof, Alphitta, Paradies etc - all fantastic food and well-trodden. Some great webcam pictures as the skies gradually begin to clear. That was certainly a big snowfall for October. The Furggsattel lift was going to open today for the first time in 2018/19 season (that is the one on the right in the photo) but the high winds mean the chairs are all back in the lift station. Fantastic to see - the Glacier is looking in good nick now. Wonder if they have had enough to get the Trockner to Furgg runs open early or will they stick to the 24th? I am pretty sure they could open those runs. They have snowmaking all they way down. Furgg is at 2400m and deep in a north facing valley so the snow is there to stay. Be nice to see them at least open it for the next couple of weekends but nothing seems to have been said so far. Always a bit tricky when the extra workforce is no lined up until the 24th. Well this morning not only was the Furggsattel chairlift up the lower glacier planned to be open but it is actually open. Hooray (ish)! Not sure I would want to be up there. Still lots of cloud (plus continuing top up of snow) and strong winds. While you can only see a couple of hundred metres, I can't see anyone coming down the piste or sitting on any of the moving chairs. Still 4 weeks until my first trip out this winter so very selfishly I am happy for it to continue like this. Slightly nerve-wracking to see the snow line predicated to move up to 3200m by next weekend....hope this isn't the case. Great to see a continuous level of snowfall (however small) coming over the weekend and next week. Looking at the GFS runs in the photo it looks warm next week but I would be surprised if the snow line was as high as that. Except for the current snowfall which Meteo Swiss’s radar projections seem to think will continue on and off through Saturday, any more snow looks more likely later in the week when the temperatures look like they could be failing again (usual caveats about approaching FI by then). Trockner webcam showing sunshine and fantastic conditions on the glacier. Furggsattel lift working away and great to see skiers enjoying the snow - envious now. Klein Matterhorn glacier still closed, Italian side opens tomorrow. The conditions will be fantastic, plenty of locals were already touring up from Plan Maison to Theodul today. 6 and 8 will be open tomorrow. Cervinia already has the pistes above Plan Maison open. From tomorrow they are opening the top section of the Ventina down from Testa Grigia. Most of the snow (and it is still coming) has been coning from the south so the Italian side has been getting the best of it. Excellent picture from Warren Smith Ski Academy of conditions in Cervinia today. Snow park on the Furgg glacier opens tomorrow for those who like that sort of thing. I must admit I prefer to keep my skis either in contact with the snow or at least reasonably close to it. Poxing well poxing poxy closed today for high winds. All well and good if you are down for a week, not so great if you came down Friday evening for a Saturday ski!! @JohnMo, seems like you know Zermatt really well! I lived there and worked at Slalom Sport in the mid 80's/early 90's! Say hi to Sparky for me, and Mark, Andreas and Glenn at the Bubble, also Brian Farquharson if you bump into him! @coddlesangers, that’s a real pity. Looks like they have managed to keep it open today but the winds are still really strong up top. @KenX, some great bars there. The fact that Zermatt is so lively is what lead to us get a place there (strictly - in Täsch, just down the valley) five years ago. At the time my adult children and I enjoyed Lech and Zermatt equally from a skiing point of view. However my non-skiing wife preferred Zermatt. KenX, whats the new restaurant called? As the Bubble has now closed we would want to try somewhere new. @twoodwar, Brasserie Uno, where the Bubble was, Swedish-based with a twist! Cheers KenX, will give it a go in March. Arriving this Thursday 15th and keen to know which restaurants in Zermatt town are open this week and next weekend. We usually come for a 2-3 night stay around this time of year-so know the options are limited-One night at the Schaefersube is always on the agenda-yum! (am aware it's currently housed elsewhere while a refurb is going on). Usually end up having a pizza or pasta at the Hotel Post too, but open to alternatives. Had been thinking of a burger and the Bubble on Thursday night, but I see from the above that it's now Brasserie Uno. Is it open? Pretty much all the restaurants away from the Bahnhofstrasse are closed until the main resort opening on 24th. However most of the restaurants on the Bahnhofstrasse from the train station to past the church are open. go Grampis for Pizza Perty, we always do. Should find it decent. Looking very dry for the week ahead. The temperatures are coming down though so the cannons will be working and they are pumping out onto a good base. Got to hope some of that uncertainty a week away (usual caveats about that far out) turns into white stuff from the sky. 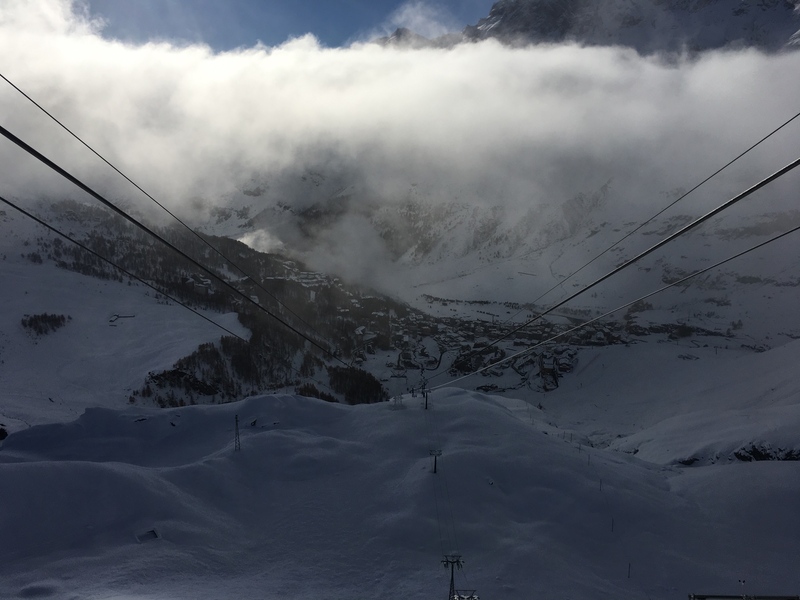 Cervinia are opening lift Z (Goillet) today. That is the far right lift in the Cervinia bowl as you look at the piste map. Not an area to go first thing as it is a slow open chairlift in pretty much the only north facing area in Cervinia. But it does open up some nice pistes and some decent side piste stuff that gets left alone by the crowds. That means every lift from Plan Maison and Plan Torrette up is open. Not every piste is but the vast majority are. A sterling effort by the lift company. With the fantastic snow that came from the south and now the blue skies anyone who went there for an early bash should be having a great time (two and a half weeks before I am back out – I am definitely counting). Great to see the Winter panoramic now up and running on the Zermatt.ch website - nothing particularly new to report other than a few tweaks here and there to the imaging and signage. As JohnMo mentioned before, a dry week ahead but good to see the snowline dropping to 170m and hanging around the sub 1000m mark for a large chunk of next week. I wonder if we will see any more fresh runs opened on the Trockner / Furgg side this weekend. The snow is certainly good enough to get the lifts down to Furgg open. I can understand them not opening up the other mountains but Trockener Steg down to Furgg should be doable. No sign of them doing so at present. Fortunately the good (or bad as in no storms) weather means the links are open so anyone based in Zermatt would probably be spending a decent amount of time over in Cervinia at present. I guess come the weekend the main opening is only a week away. 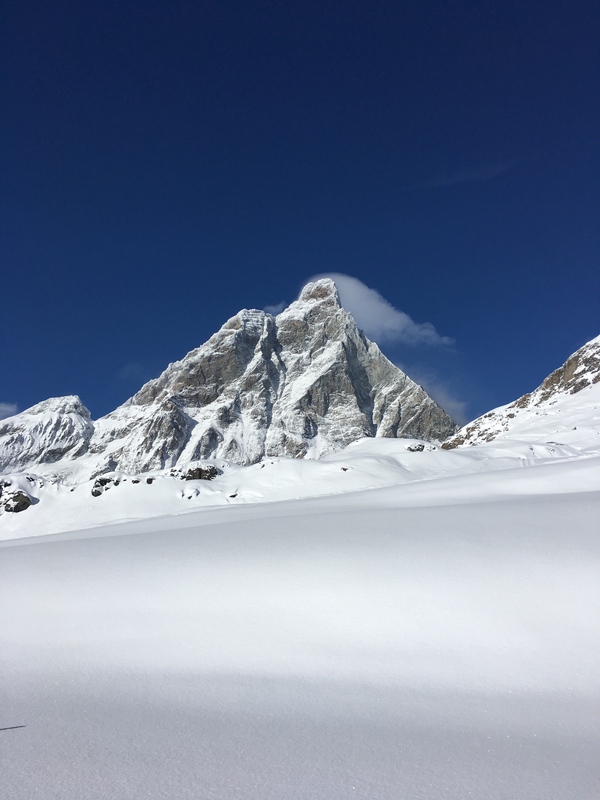 "Sunnegga and Gornergrat ski areas were due to open on 24th Nov but, due to limited snow below 2300m and temperatures too warm to make snow til now, they've pushed back the Sunnegga opening til Dec 1st. The Gifthittli chair at Riffelberg will open on the 24th Nov but the best snow will be up around Trockener Steg until we get another storm come through. Assuming the temperatures stay low enough (it's due to get really cold here in a day or two), there'll be plenty of snow made even if it doesn't snow naturally and there will be pistes open across the resort at the start of December". A quick question for Zermatt experts. When snowboarding in France, I always top up my ski pass (and my travel insurance) with additional local insurance for mountain rescue to cater for the worst eventuality of a helicopter rescue etc. Is this available and/or recommended in Zermatt? Great day today. Started a bit cloudy with a fair old wind coming over the top from Cervinia. We were skiing in cloud and snow at top of Furgsattel chair, with better vis lower down. Pistes excellent. Up top on Klein Matterhorn we were above the cloud. Links to Cervinia open on both sides, and there had been a mini dump of about 3-6 inches on the Italian side, though it was pretty murky on first ski down. However, the sun came out at around 1.30pm and Mr P and I had a wonderful descent on and off the piste en route to lunch at Chalet Etoile. We didn’t expect any off piste fun this weekend, so this was a real bonus. Great to hear - sounds like a real early season treat. I hope the new Klein M lift lives up to all the type? Also great to see the cannons working away on Gornergrat and Sunnegga. @Perty, good stuff. Nicked this photo form Summi Ski School’s video. This is coming down from Furggsattel to Trockener Steg. Conditions on the Cervinia side look even better. A++ for the new lift to Klein Matterhorn. Smooth and speedy. It makes heading up there as by far the best and quickest route for getting to Italy, whereas before we have often thought the t bar route was better than standing in a queue for the cable car- even at minus 10 deg. We were pretty spoilt this weekend - no queues. It’ll be interesting to hear how busy it gets in peak weeks. Some interesting stuff over the next few days. Temperatures are staying low so if both of those snowfalls happen in the next five days the town could be white. That would be nice as this weekend is the opening of the main areas.